Join us for the Carpe Diem-Washington Revels Family & Community Sing. This month we celebrate the Season and the Solstice, with caroling in the Seekers neighborhood followed by hot cocoa, cider and cookies! Everyone is welcome to bring refreshments and songs to share. Sign up in advance to lead a song by contacting Jo Rasi (jrasi@revelsdc.org). Or just show up to sing (or even just to listen)! DATE/TIME: Friday, December 21, 2018, 6:30-8:30 pm. 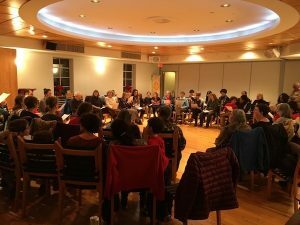 We gather on the 21st of every month — join us on January 21 for our next Sing!